I found this tag on Kung Fu Monkey. Thought it was an interesting challenge and decided to give it a whirl. “The challenge is to explain America to someone from somewhere else by giving them 10 movies to watch. 1) Field of Dreams (1989) – One word: baseball. Paired with a touch of magical realism, a game of catch between father and son, road trips with no destination, Burt Lancaster’s last role, dreaming big when no one else believes, and listening to voices no one else hears. 2) Almost Famous (2000) – A witty coming of age picture with great music. You could probably argue that this one doesn’t belong on the list, but I think it shows a fun and loving side to America. 3) Woman of the Year (1942) – The first pairing of Hepburn and Tracy. It’s all about career, love, and the battle of the sexes. It all about the compromises to have a successful marriage and career. 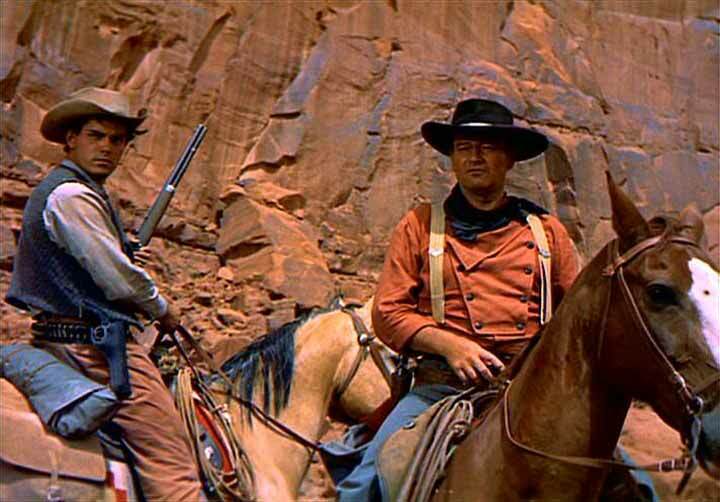 4) The Searchers (1956)– To have a list of American movies without including a Western, is sacreligious. To have a Western but not a John Ford directed picture, is just crazy. But including a Western on any list and it NOT starring John Wayne would be like a day without sunshine. Westerns are America. Simple enough. 5) To Kill a Mockingbird (1960)- A man who possesses great honesty, integrity, and wisdom, stands up against the injustice of a fellow man. Atticus Finch, the greatest hero in American film. We can learn a lot from him. 6. Mr. Smith Goes to Washington (1939) – A naive man takes on the supremeacy and corruption of the US Senate. Politics in this country aren’t always pretty and this movie shows that. 7. The Breakfast Club (1985) – A brain, an athlete, a basket case, a princess, and a criminal. The stereotypes of an American high school. 20 years later and this film still resonates. 8. Manhattan (1979) – Most Woody Allen films are a testimate to New York City. From the black and white cinematography to the shots of the NY skyline, this film showcases how far the love of a city and of home stretches. This is my city…. I’ve been through a lot with her over the years. 9. Out of the Past (1947) – The first film noir ever. Romance, mystery, thriller. Every person has their skeletons and you may never know the truth. 10. The Graduate (1967) At some point in life, we all feel like Benjamin. We’re a little lost in the big world and in Benjamin’s case, being smart and wealthy isn’t much help. If only we had Mrs. Robinson to fill the void. Obviously, there is a lack of romantic comedies and not every great star is represented. Perhaps a documentary could have been included. But ten is a small number when it comes to selecting films. There are so many good movies that represent American ideals and culture, picking ten was enough work. I tried. Now it’s your turn. Good picks for movies about America. I haven’t seen all of them, but the ones I have seen on your list definitely belong there. Mr. Smith Goes to Washington is the epitome of the American spirit and dream. That movie is so great because both Republicans and Democrats can appreciate what it is about. American Grafitti? Man I thought I was a movie buff but this is a tough one. I haven’t seen most of the movies on your list so I’ll need to load up the que (sp?). Did I forget American Garffiti? Actually, I could easily replace Almost Famous with American Graffiti. But I chose Almost Famous because it’s a recent release. This is very difficult. For documentary, perhaps The Thin Blue Line? Sort of a look into our legal system, even though you already have that represented with Mockingbird. A Pixar film (I’m thinking Wall-e or Up) about dreams and aspirations wouldn’t be bad. And have you seen Some Like it Hot? Man, I wrote this list so long ago. I would only include The Searchers, Manhattan, and maybe To Kill A Mockingbird now. A lot changes in five years. I love Some Like It Hot; it’s a favorite.